The CNA Salary in KY (Kentucky) depends on the city you work in and the type of health care facility you are employed at. Certified nursing assistants are health care professional who render quality care to various patients including bathing, grooming, monitoring vital signs, and assisting patients with ROM exercises. They work under the supervision of LVNs as well as registered nurses. The employment outlook for CNAs is expected to increase about twenty-one percent in the coming years. 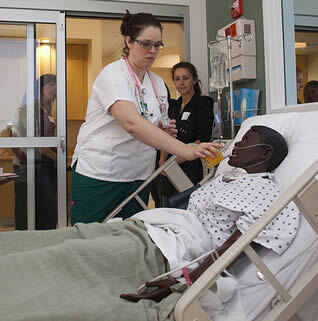 In Kentucky, certified nursing assistants can have initial entry level earnings of approximately $17,000 a year. This can range from $17,000 to $19,000 every year. As nursing assistants work longer and gain experience in the health care field, the earnings can rise up to $26,000 to $29,000 per year. The average income of full time employed CNA is about $14 for each hour. Self-employed certified nursing assistants earn more with an average of $8 to $14 per hour. In order to flourish one’s career as a CNA, it is vital to have an understanding on some factors which have an effect on the career and these include the years of work experience, employer, and job location. Experience – this has so much to do with regards to the salary that certified nursing assistants make. CNAs having a minimum of one year work experience is much more preferred by the employers. To be able to gain a working experience, employees can start working at health care agencies or nursing facilities because hospital employers usually hire those that have experience already.When a CNA has already gained experience, there is bigger room for opportunities like being able to apply to jobs that offer higher salary wages with more benefits. Employer – the salary of CNAs is based on the employer’s decision. No matter how many years of experience a worker has, only the employer has the discretion as to how much pay one receives. While there are also other employers who are offering higher pay with benefits so that CNAs will continue to work for them. Job Location – various areas offer different pay rates. Urban areas have higher salary wage compared to rural areas. The basis of this is the cost of living or the particular location. In comparison to other states, Kentucky provides less income for entry level nursing assistants. However, Kentucky has an overall lower cost of living that can compensate for the lower pay. To become eligible for employment as a certified nursing assistant one must take the state exams and receive entry on to the state registry. To learn the necessary skills and prepare for the exams you can enroll in CNA classes in KY. Courses cover a total of 75 hours of instruction including hands on skills training and classroom prep.